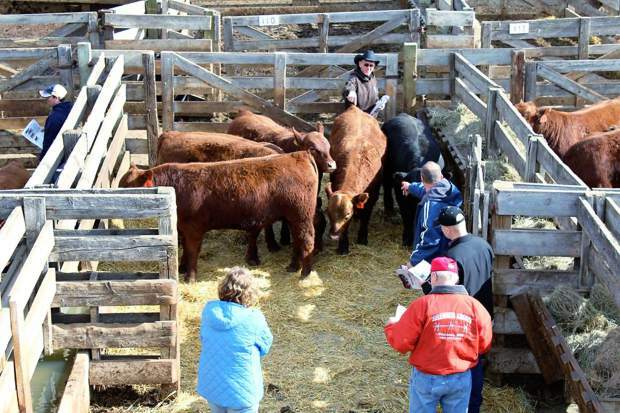 Brenner Angus sold both Red and Black Angus bulls at their annual bull sale. Buyers and onlookers in the alley at the Brenner Angus sale. 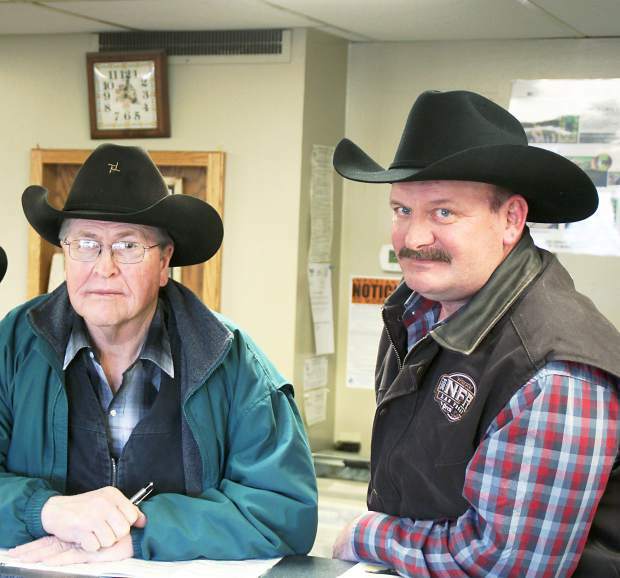 Sid Brenner and Jeff Werner at the Brenner Angus sale. 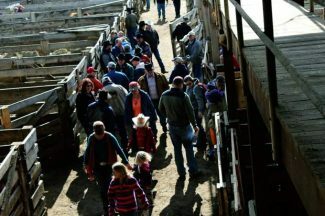 Brenner Angus held their annual bull sale at Kist Livestock Auction, Mandan, ND. 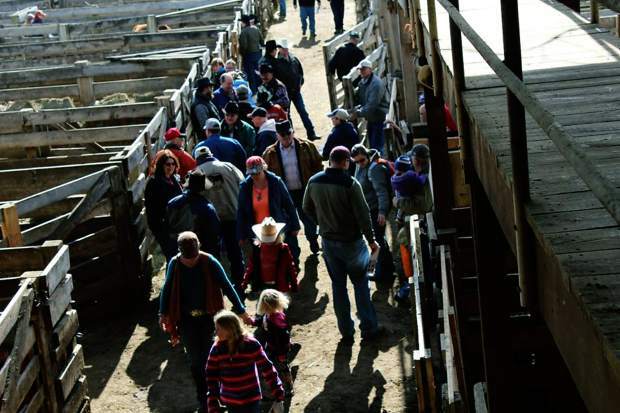 A great crowd of both new and repeat buyers was on hand for the sale. These bulls had not been pushed, they were fed a moderate growing ration throughout the winter and should be able to go out and work in the breeding pastures without falling apart. The goal at Brenner Angus is problem-free cattle that will calve on their own, breed back and bring in a big calf at weaning time. The sale offering was very uniform in type and structurally correct with good feet and legs. There were bulls to fit most any operation. 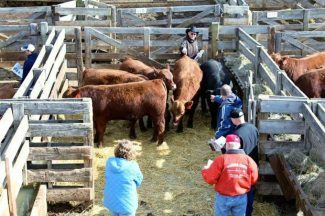 Offering both Red and Black Angus, yearling, fall yearling and two year old bulls, this is a one stop sale for many buyers. Lot 46, SMB Oahe Dam 5625 is a Feb. 2015 son of SMB Oahe Dam 2596. This black Angus calving ease performance bull has epds of CED 11 BW -0.6 WW 66 YW 108 Milk 27. The bull had a 69 lb. birth weight, 712 lb. 205 wt. and 1409 yearling wt. Neil Cattle Co., Cozad, NE was the buyer at $8250. Selling at $7250 was lot 45, Brenner Ribeye 5515, a Mar. 2015 son of Ellingson Ribeye 3195 with epds of CED 6 BW 1.8 WW 72 YW 124 Milk 29. Another power bull with 205-day wt. of 777 lb. and yearling wt. of 1457. Larry and Leah Jung, Isabel, SD were the buyers. Selling at $7000 was lot 47, Brenner Registry 5565, a mar. 2015 son of SAV Registry 2831 with epds of CED 4 BW 0.9 WW 52 YW 92 Milk 26. Jeff Werner, Carson, ND was the buyer. Lot 8, TBS New Direction 5586, a Mar. 2015 son of Andras New Direction R240 topped the Red Angus bulls at $7,000. This bull has epds of CED 7 BW -2.6 WW 75 YW 121 Milk 24. Jerry Olson, Selby, SD was the buyer. Lot 1, TBS Loaded Sakic 5559, an Apr. 2015 son of BHR Bases Loaded 389 with epds of CED 2 BW 1.2 WW 77 YW 124 Milk 23, selling to Jess Schilling, Selby, SD at $6750. Lot 3, TBS Trilogy 5671 is a Mar. 2015 son of GMRA Trilogy 0226 with epds of CED 8 BW -3.6 WW 75 YW 123 Milk 17 that sold to Tim Zable, Lowery, SD.